When was the last time you had enough time to sit down and read a book? Use your plane ride as a chance to read a book you’ve been putting off and relax your mind. Get something pulpy and captivating (they’re called airport books for a reason), and your flight will go by in no time. If you get tired reading or experience motion sickness, download an audio book instead. If you’re traveling for work, get some work done while you’re on the plane. You’ll have hours to kill with no distractions, making it the perfect opportunity to concentrate. Download whatever you need onto your laptop or tablet, and make sure it has a full charge before you board. This time is especially useful if you need to write, create a presentation or catch up on admin tasks like data entry. If you get nervous on planes, pack a mindless activity that will keep you occupied for a long time. Adult coloring books are all the rage right now because they help you relax and unwind. Buy a mandala, nature or character coloring book and a pack of colored pencils and start coloring. Technology has made traveling so much easier. T-Mobile is now offering free Wi-Fi for an hour to all of their customers. This is enough time to catch up on one of your favorite shows or get some work done. Their plan also provides you with unlimited texting and picture messaging, so you can keep your family and friends updated on your progress. Before you take off, you should download some of your favorite TV shows and movies, games, books and other apps to keep you occupied. Your phone works as an all-around entertainer on your flight without taking up any room in your bag. Games aren’t just for kids. Pack a deck of cards, Sudoku, crossword puzzles and word searches to keep your mind and hands busy. If you’re traveling with someone else, bring a game you can play together that doesn’t require a lot of space. Buy a gaming console, like Nintendo Switch and PlayStation PSP, to play some of your favorite video games. With your in-flight Wi-Fi, you may even be able to play online with your friends. 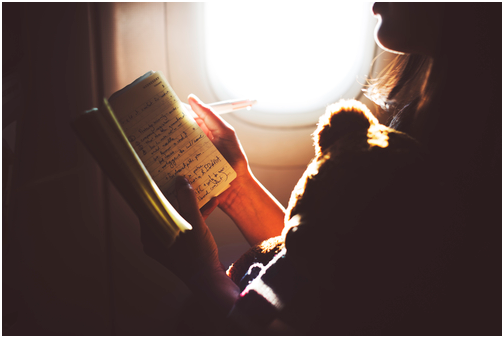 If you’ve always thought about journaling, your plane ride is a great time to start. Write about your trip, including what you’re excited or nervous about. Write about all of the things you want to do during your trip or about the next vacation you want to take. This is also a good time to write post cards to your family and friends. They’ll love receiving something in the mail, and you’ll have a great time writing to them about your trip. This is always a good standby on plane rides. Chances are you’re exhausted from your trip, so put on a pair of noise-canceling headphones, lie back and enjoy some much-deserved rest.